I recovered from my failed attempt at making pique and chose another dish from A Return to Cooking to follow the crab salad. I should say, I eventually chose another dish. It took some time to decide with options like paella, curried napa cabbage bundles, monkfish with sofrito, and seared tuna with ratatouille all in the Puerto Rico chapter. In the end, my choice was sauteed mahi mahi with okra and citrus vinaigrette because okra is in season and abundant in Texas right now. I realize okra isn’t for everyone, but I’m a fan. I like it just slightly cooked with a little crunch, I’m happy with it fried, it’s always good stewed in gumbo, and the pickled version is a delight. Kurt, however, is a little more iffy about this vegetable. He’s not completely opposed to it, but he always needs some convincing. For this dish, the okra was cut into half-inch pieces, and then it was simply sauteed in canola oil and seasoned with salt and pepper. The fish was seasoned with salt, pepper, and curry powder, and it was sauteed in canola oil. The vinaigrette required the most ingredients with dijon, lime zest, orange zest, lemon zest, lime juice, sherry vinegar, shallot, ginger, and canola oil. Once the vinaigrette was whisked together, seeded and diced tomatoes were added. For the presentation, the fish and okra were placed on a plate, the vinaigrette was poured over them, and tomatoes were spooned on top. I didn’t realize cooking like Eric Ripert could be so easy. The pan sauteeing gave the fish a nice crust, and the citrus vinaigrette was a good match for the flavor of mahi mahi. Unfortunately, the curry powder got lost along the way. I didn’t taste it at all once the sauce was on the fish. However, another good match was the vinaigrette and tomatoes with the okra. The okra’s slime factor was nonexistent because the cut ends browned just slightly in the pan. Also, the brief cooking time prevented the okra from becoming mushy. I was shocked that such a simple preparation inspired Kurt to proclaim it the best okra ever. The only change I would make next time would be to sprinkle a little extra curry powder on the fish before cooking it, but this was an easily repeatable success of a dish. 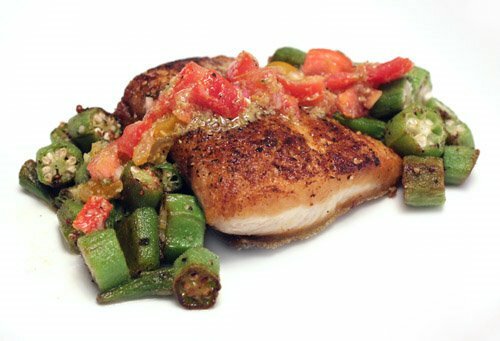 I was just looking for non-fruity preparation of Mahi - this sounds so delicious with Okra and Citrus Vinaigrette! Can't wait to try it! This looks fabuloso & I can't wait to try making it! It seems like no one tries to incorporate okra into new dishes, so I'm impressed! Just gorgeous. Very rare for folks like us to see okra that's not 1) fried or 2) in gumbo. Very refreshing! I've never eaten mahi-mahi... That dish looks fantastic! I love cooking fish this way. I have to second duo on this one. Only time I ever see okra is gumbo or fried. Heck I don't know if I have ever had it. Lovely. I was actually craving for mahi mahi a couple days ago. This looks great. I may have to take a trip to the fish monger soon. i LOVE okra, and if i didn't know that was mahi mahi, i'd probably scarf down the whole dish before i realized that (gasp) i was eating seafood. terrific dish, lisa! It's been such a long time since I have okra. Sounds like delicious pair for mahi mahi. This is a fantastic dish. I love any fish. Great pics. I love the okras and tomatoes. They looked perfect with the fish. Mmmnnn, delish! And your pictures are beautiful. Your mahi mahi looks perfectly cooked! I've never cooked with okra before, but it sounds perfect with the citrus sauce! Just goes to show that the old adage -- the simpler, the better -- is almost always true. Nice to know that you don't have to jump through hoops to make okra taste so very good. I love okra and always crave my grandmother's sauteed okra and tomato recipe during the summer. Great dish, and fantastic ingredients! 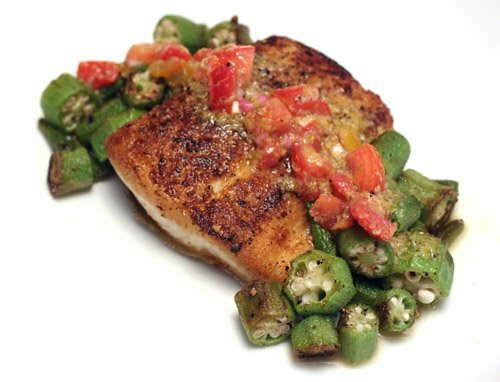 Okra and mahi-mahi sounds wonderful together. The texture must be lovely! Kat: mahi mahi is a sturdy, white fleshed fish. It has a little bit of oiliness and is less delicate than halibut. Grouper might be a good substitute. Oh I adore okra too, though at first I was turned off by its "fur". This dish looks delicious! Can you believe I've never had okra? This is a lovely mahi mahi & okra dish!! I so love the combination of fine & delicate flavours!! A must try , Lisa!! Love all the combos, don't know why, but I always loved okra - even as a kid, of course I suspect that it something to do with it being batter fried, but I dunno. I've never tried Okra, but it looks like it pairs PERFECTly with that dish. Absolutely gorgeous dish! Just jumped over here from Junglefrog where she passed on the award that I had given her to you. Wonderful blog and this dish is fantastic! Yummy citrus vinaigrette for fish! Mmmm. Great way to combine flavors and textures! 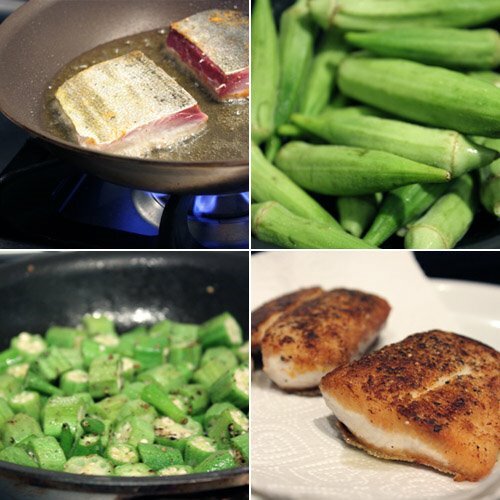 I love mahi mahi and can imagine how delicious it must be on a bed of creamy and delicious okra. Okra caught my attention over here, and these seem like they would go well together...now I want okra!